Canary Islands in relation to the coast of Africa (1758, public domain). 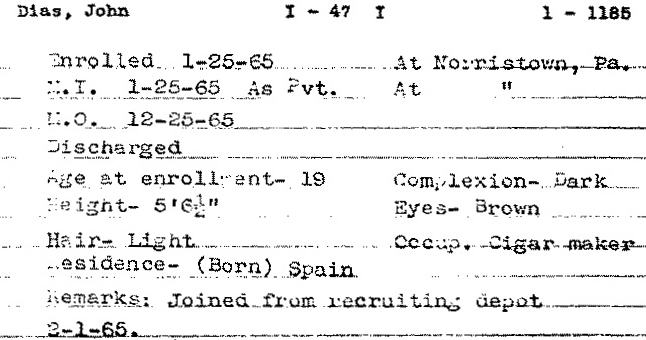 Like his parents before him, John W. Diaz was a native of the Canary Islands. Born on the island of Tenerife in July 1846, he grew up in that Spanish territory during a period of economic turmoil and transformation. Colonized by Spain during the late 1400s, this archipelago located off the northwestern coast of Africa was highly prized for the flora and fauna spread over its seven islands, including native plants and animals used to manufacture colorants which transformed the yarns and other textiles of the day into beautiful garments and household goods. Among the most cherished finds was the cochineal, a parasitic insect living off of island cacti which produced carminic acid – a substance employed in the fabrication of crimson dyes. The last of the Canary Islands to be colonized by Spain, Tenerife finally fell to Castilian troops in 1496 after a 32-year struggle. As Spain’s colonization took hold, occupiers enslaved many native inhabitants, forcing them to cut down Tenerife’s abundant forests in order to farm the lands of newly created plantations. These actions ultimately enabled Spain to convert Tenerife and the other islands of the archipelago into a hub for one of their nation’s sweetest sources of income – the sugar industry. 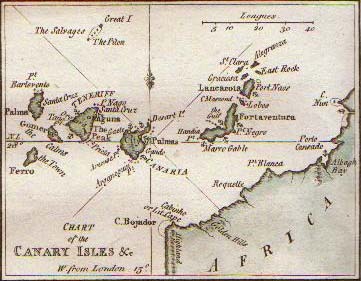 As a result, the 18th century economy of the Canary Islands was largely driven by sugarcane harvesting and shipping – engines which suddenly lost their steam during the 1800s as Spain ramped up its involvement in the Ivory Coast slave trade and shifted sugar operations to Cuba, Venezuela and the Spanish-American territories of Louisiana, Puerto Rico and Texas. Dissatisfied with their declining standard of living, many Canary Islanders chose to leave all that they knew behind in search of greater opportunities abroad. John Diaz (aka Dias), Pennsylvania Civil War Veterans’ Card File entry (public domain). At the age of 19, John Diaz enrolled and mustered in for Civil War military service at the Union Army recruiting depot in Norristown, Montgomery County, Pennsylvania. On 25 January 1865, he entered at the rank of Private, and was assigned to Company I of the 47th Pennsylvania Volunteers, an infantry unit which had made history as the only Pennsylvania regiment to fight in the Union’s 1864 Red River Campaign across Louisiana and which had distinguished itself during Major-General Philip Sheridan’s tide-turning 1864 Shenandoah Valley Campaign in Virginia. Military records described John Diaz as being a native of Spain who was employed as a cigar maker, and was 5’ 6½ “ tall with light hair, brown eyes and a dark complexion. He connected with his regiment on 1 February 1865 by way of a second recruiting depot. Assigned to the Provisional Division of the 2nd Brigade of the Army of the Shenandoah in February, Private John Diaz and his new 47th Pennsylvania Volunteer comrades were ordered to move from Virginia to Washington, D.C. via Winchester and Kernstown. 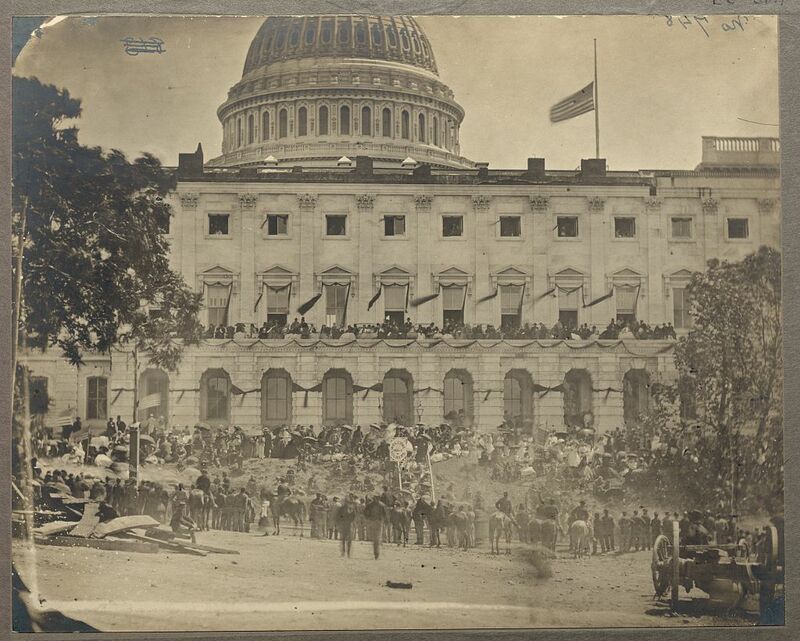 By 19 April 1864, they were encamped near Fort Stevens, and were responsible for helping to defend the nation’s capital following the assassination of President Abraham Lincoln. Letters home and later newspaper interviews with survivors of the 47th Pennsylvania indicate that at least one 47th Pennsylvania Volunteer was given the high honor of guarding President Lincoln’s funeral train while others may have guarded the primary Lincoln assassination conspirators during the early days of their imprisonment and trial. An early thinning of the 47th Pennsylvania’s ranks began on 1 June 1865 when a General Order from the U.S. Office of the Adjutant General provided for the honorable discharge of several members of the regiment, including I Company’s Corporal Joseph Kramer, John J. Lawall, Jesse Moyer, Stephen Schechterly, Samuel Smith, Israel Troxell, D. Wannamaker, and Sylvester McCape. 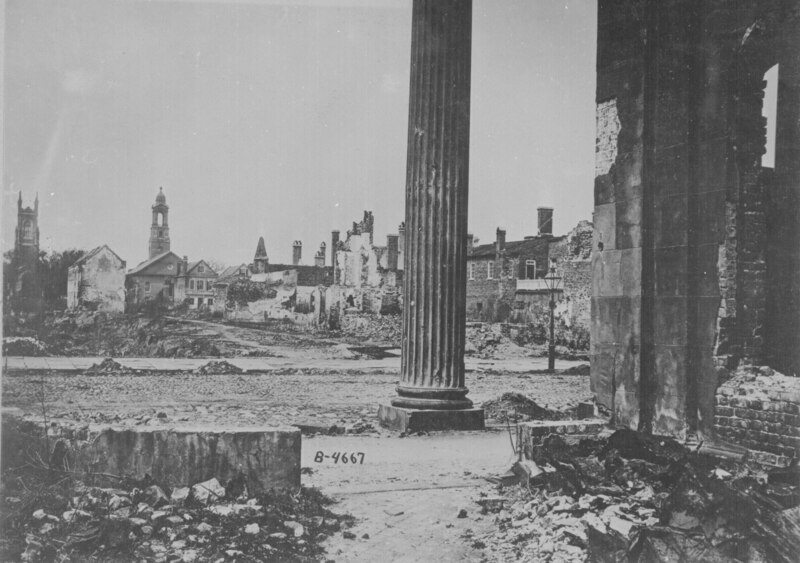 Ruins of Charleston, South Carolina as viewed from the Circular Church, 1865 (U.S. National Archives and Records Administration, public domain). Ordered to undertake a tour of duty in America’s Deep South as Spring turned to Summer, the men of Company I and their fellow 47th Pennsylvania Volunteers were stationed in Savannah, Georgia from 31 May to 4 June. Again in Dwight’s Division, this time they were attached to the 3rd Brigade, Department of the South. Relieving the 165th New York Volunteers in July, the 47th Pennsylvania Volunteers next quartered in the former mansion of the Confederate Secretary of the Treasury at Charleston, South Carolina. Duties were largely Provost (military police and civic governance) and Reconstruction-related (repairing and/or rebuilding key parts of the regional infrastructure that had been damaged or destroyed during the long war). Finally, beginning on Christmas day of that year, the majority of the men of Company I, 47th Regiment, Pennsylvania Volunteers (including Private John Diaz) began to honorably muster out at Charleston, South Carolina – a process which continued through early January. Following a stormy voyage home, the 47th Pennsylvania disembarked in New York City. The weary men were then shipped to Philadelphia by train where, at Camp Cadwalader on 9 January 1866, the 47th Pennsylvania Veteran Volunteers were officially given their discharge papers. John Diaz, April 1868 Rubeola recovery (Philadelphia City Hospital discharge ledger, 29 April 1868, public domain; double click to enlarge). Following his honorable discharge from the military in 1865, John Diaz stayed in Philadelphia, where he resumed the trade of cigar making. Sometime during the late Winter or early Spring of 1868, he contracted the measles (Rubeola). As the disease progressed, he was admitted on 22 April 1868 to City Hospital in Philadelphia, where he convalesced, survived, and was discharged a week later (on 29 April). That same year, on New Year’s Eve (31 December 1868), he wed Annie Rose Lambert. A daughter of a native of Germany, she was a native of Pennsylvania who had been born in Philadelphia in January 1848. By 1870, John and Anna Diaz were residents of Philadelphia’s 20th Ward, their surname spelled as “Deiz” on the federal census that year. In July, they greeted the arrival of their son, Gustavus Henry Diaz, followed by son Adolph in October 1871 and, in September 1873, son John. Death of John and Annie Diaz’s son, John (Philadelphia death and burial record, 1875, public domain). Sadly, this namesake son of John Diaz did not survive infancy. Sometime in late 1874 or early 1875, John Diaz fell ill with whooping cough. As the illness worsened, the 17-month-old developed congestion of the brain and died in Philadelphia on 19 February 1875. Two days later, on a cold Winter day, his parents, John W. and Annie Diaz, laid his tiny body to rest at Philadelphia’s Odd Fellows Cemetery. * Note: The remains of John Diaz (1873-1875) were exhumed in 1951 with those of 65,000 other individuals who had been buried at the cemetery at 23rd and Diamond Streets in Philadelphia when that original Odd Fellows’ graveyard was closed in order to free up the ground for a new housing development. The remains of all of the disinterred were laid to rest again that same year at the Lawnview Cemetery in Rockledge, Montgomery County, according to the operators of both cemeteries – the Odd Fellows’ Cemetery Company of Philadelphia. Joy returned to the Diaz home mid-decade with the birth of another son – Frank – in Ashland, Camden County, New Jersey in October 1875. Another namesake son – John Diaz, Jr. – arrived at the Diaz family home in Philadelphia on October 1877, followed by the first Diaz family daughter – Marceline (1879-1972) – in Philadelphia on 23 October 1879. Spelling the Diaz family surname as “Deaz,” the federal census taker of 1880 noted that cigar manufacturer John W. Diaz still resided in Philadelphia with his wife “Annie” and their children: Gustavus, Adolphus, Francis, John, and “Marcellina,” and also documented that they lived next door to pocketbook maker Gustavus Lambert (possibly the father of Annie Diaz), and his wife Charlotte and their children. A year later, a namesake daughter for family matriarch Annie (Lambert) Diaz opened her eyes for the first time at the Diaz family home. Born in Philadelphia in October 1881, the newest little one was christened as “Anna Diaz.” Another son – Herbert – arrived on 28 November 1883. 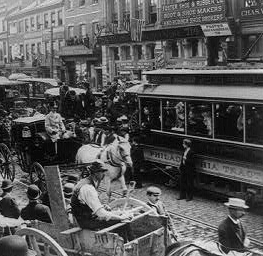 Street Scene, Philadelphia, 1897 (B. W. Kilburn, U.S. Library of Congress, public domain). The 1890s also became notable years for for the Diaz family – for several reasons, including the birth of John and Annie Diaz’s final child and the start of a new family by their eldest son. On 3 March 1891, John and Annie Diaz welcomed son Philip (1891-1918) to their Philadelphia home. Then, six years later, on 24 February 1897 in Philadelphia, firstborn son Gustavus Henry Diaz wed Pauline Philipps (a native of Germany who had been born in September 1876). Before the year was out – on 14 December 1897 – Gustavus and Pauline were greeting the arrival of daughter Anna Rose Diaz (John and Annie Diaz’s first grandchild), who was then baptized on 28 February 1898 at St. Michaelis and Zion Church in Philadelphia. Son Adolph Diaz followed in December 1899. Over the next several years, John and Annie Diaz greeted the Philadelphia arrival of more grandchildren – Charlotte (in 1903) and Gustavus Henry Diaz, Jr. (on 2 June 1905) – both children of their eldest son Gustavus Henry Diaz, Sr. and his wife, Pauline (Philipps) Diaz. Then, sometime between 1906 and 1910, John and Annie Diaz moved to New Jersey with several of their children. By 1910, they were living in Berlin, Camden County, New Jersey with their daughter Annie at the home of their son, Gustavus Diaz, and his wife, Pauline, and their children: Adolph, Charlotte and Gustavus Diaz, Jr. The family cigar business continues as John Diaz’s Sons (Boyd’s Philadelphia Directory, 1910, public domain). That same year (1910), Gustavus and Adolph Diaz – the eldest sons of John and Annie Diaz – were operating their own cigar business – “John Diaz’s Sons” at 37 South 10th Street in Philadelphia. 1910 was also memorable because the 28-year-old daughter of John and Annie Diaz – Anna Rose Diaz – had begun her own family by marrying Salem, New Jersey native Herbert Ellsworth Morton on 1 January 1910 at St. Michaelis and Zion Church, Philadelphia (the same church where her niece Anna Rose Diaz – daughter of her brother Gus and granddaughter of John and Annie Diaz – had been baptized in 1898). The 29-year-old Morton, who had been born on 15 September 1880, was a son of Joseph and Royal Morton, and was employed at that time as a bookkeeper for a local sign manufacturer. Herbert and Anna (Diaz) Morton had been married just four months when the census taker knocked on their door in April 1910. Also residing with the newlyweds in Philadelphia’s 38th Ward that month were Annie’s brothers, Herbert Diaz (aged 26), who was still employed as a clerk with a cigar shop, and Philip Diaz (aged 19), who was also employed as a clerk (but at the local library branch). Pvt. 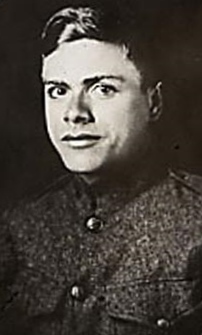 Philip Diaz, U.S. Army, 1917 (public domain). Three years later, the youngest member of the Diaz family – Philip – became a member of the First Presbyterian Church of Haddonfield in Camden County, New Jersey, “having united on Confession of Faith, May 18th 1913,” according to church records. By 1915, family patriarch and matriarch John and Anna Diaz were documented on New Jersey records as residents of Ashland in Delaware Township, Camden County, New Jersey. Living at home with them in 1915 were sons Adolph, Frank, Herbert, and Philip. According to U.S. Veterans Administration Pension Payment Cards, Civil War veteran and naturalized American citizen John W. Diaz died on 5 September 1915. He was survived by his wife, Annie, and their children and grandchildren. The graves of John and his wife have not yet been located, but researchers for 47th Pennsylvania Volunteers: One Civil War Regiment’s Story continue their search, and hope that descendants of the Diaz family or others researching this family line will reach out with information regarding their final resting places. For more information about the heroic World War I service of John Diaz’s youngest son, Philip, and other details about surviving members of the Diaz family, please read part two of this biographical sketch, What Happened to the Family of John Diaz? 1. Bates, Samuel P. History of Pennsylvania Volunteers, 1861-5. Harrisburg, Pennsylvania: B. Singerly, State Printer. 2. Diaz, Anna Rose, Gus Diaz, John Diaz, and Anna Lambert, in Birth and Christening Records. Philadelphia, Pennsylvania: Philadelphia City Archives and Historical Society of Pennsylvania, 14 December 1897 and 2 June 1905. 3. Diaz, Anna Rose, Gustavus Diaz and Pauline (Philipps) Diaz in Baptism Records. Philadelphia, Pennsylvania: St. Michaelis and Zion’s Church, 28 February 1898. 4. Diaz, Anna and Herbert Morton in Marriage Records. Philadelphia, Pennsylvania: St. Michaelis and Zion’s Church, 1 January 1910. 5. Dias, John, in Civil War Veterans’ Card File, 1861-1866. Harrisburg, Pennsylvania: Pennsylvania State Archives. 6. Diaz, John, in City Hospital Admissions and Discharge Records. Philadelphia, Pennsylvania: Philadelphia City Archives and Historical Society of Pennsylvania, April 1868. 7. Diaz, John W. (death date) and Annie Diaz (widow and pension recipient) in Pension Payment Cards. Washington, D.C.: United States Veterans Administration, 5 September 1915. 8. Diaz, Philip. Confession of Faith, Membership and Other Church Records. Haddonfield, New Jersey: First Presbyterian Church of Haddonfield, 1913-1918. 9. 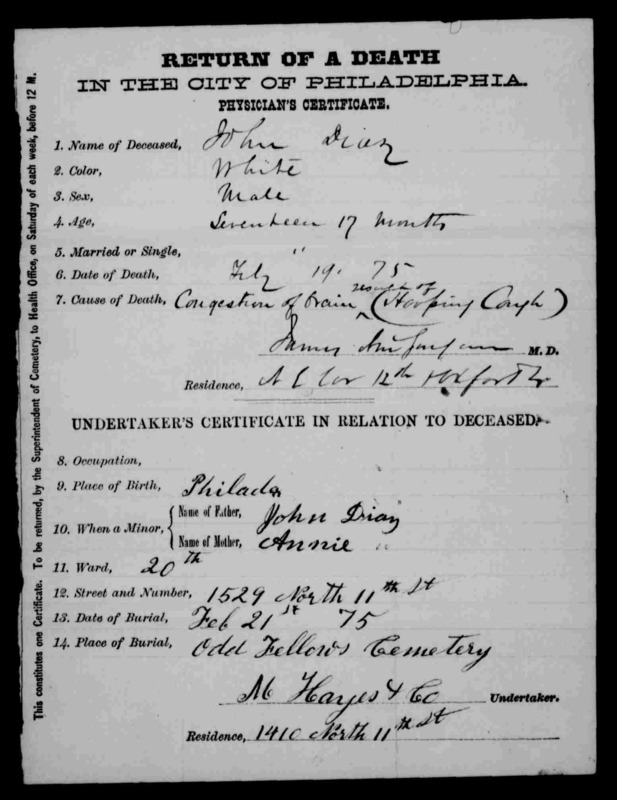 John Diaz (deceased son), John Diaz (father) and Annie Diaz (mother), in Death Records (Philadelphia city death ledgers), and in Return of a Death in the City of Philadelphia-Physician’s Certificate, and in Undertaker’s Certificate in Relation to the Deceased (death and burial certificates). Philadelphia, Pennsylvania: Philadelphia City Archives and Historical Society of Pennsylvania, 19 and 21 February 1875. 10. 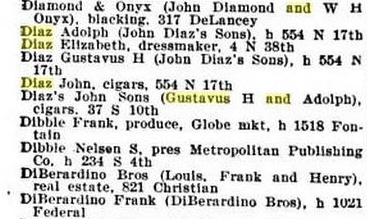 John Diaz’s Sons (cigar business of Gustavus H. and Adolph J Diaz). Philadelphia, Pennsylvania: Boyd’s Business and Co-Partnerships Directory: Philadelphia, 1910. 13. Parker, Matthew. The Sugar Barons: Family, Corruption, Empire and War in the West Indies. New York, New York: Walker & Company (Bloomsbury), 2012. 15. U.S. Census. Washington, D.C., Pennsylvania and New Jersey: 1870, 1880, 1900, 1910, 1920, 1930. 16. U.S. Veterans’ Schedule (1890). Washington, D.C. and Pennsylvania: 1890.